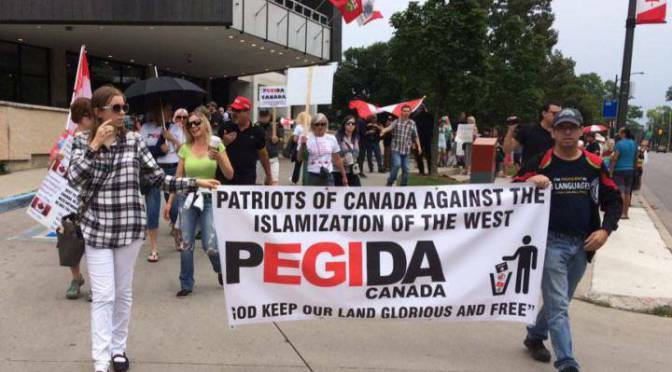 Pegida, an anti-Islam group active in Canada and with connections to white supremacists and neo-Nazis in Europe (particularly Germany), has been holding regular rallies in London, Ontario. While Pegida have made few inroad on their own in London, they have made growing links with neo-fascist groups like Soldiers of Odin (SOO) and Proud Boys. On Saturday, October 13, 2018, a rally of several Pegida members along with a dozen or so SOO and a few Wolves of Odin and other neo-fascist supporters was confronted by a much larger counter-mobilization of antifascists. With cops present the fascists held their ground outside the City Hall building. London is the sort of city one might expect fascists to receive some reception in. It is a mid-size city in Canada known to be generally politically conservative with a sizeable white collar professional workforce with many company headquarters located there. It could well be a foundation for fascism as a conservative white collar middle strata feels squeezed by economic pressures from above (capital, ownership) and social demands from below. And clearly Pegida and SOO and others see it that way given their persistence in holding events there. On multiple occasions they have held events outside City Hall. Of note, a SOO member gave a positive shout out to local city councillor Phil Squire. That the mainstream politicians are open in working with fascists is something that bears attention and response in Canada as elsewhere. It appears to be a more common phenomena in Canada as witness in Edmonton where three United Conservative Party candidates openly partied with SOO, including taking photos with them at a campaign event. Perhaps more infamously, Rob Ford, Premier of the country’s largest province Ontario has taken photos with fascist Toronto mayoral candidate Faith Goldy and her entourage. When called out, Ford, unsurprisingly given his own politics, refused to apologize. On October 13th, the antifascists gave Pegida a reason not to come back. And showed that as their numbers remain small the opposition seems to be growing in size and confidence. I think Doug Ford may be incorrectly referred to as Rob Ford in this article… not certain though.